Kristin’s in Braintree serves breakfast and lunch 7 days a week (Monday-Friday 6:30 AM – 2 PM; weekends 7 AM – 1:30 PM). Up until last month, I had only ever had breakfast at Kristin’s. Their breakfast menu is a lot more extensive and interesting than their lunch menu. The breakfast menu contains a ton of creative pancake and french toast options listed on their board, homemade corn beef hash, assorted eggs Benedict selections…and so on…I’ve found that the most interesting choices are usually on the Daily Special Board. Well, we were in the neighborhood recently and decided to stop in for lunch. I ordered the Ultimate Turkey sandwich ($5.25). 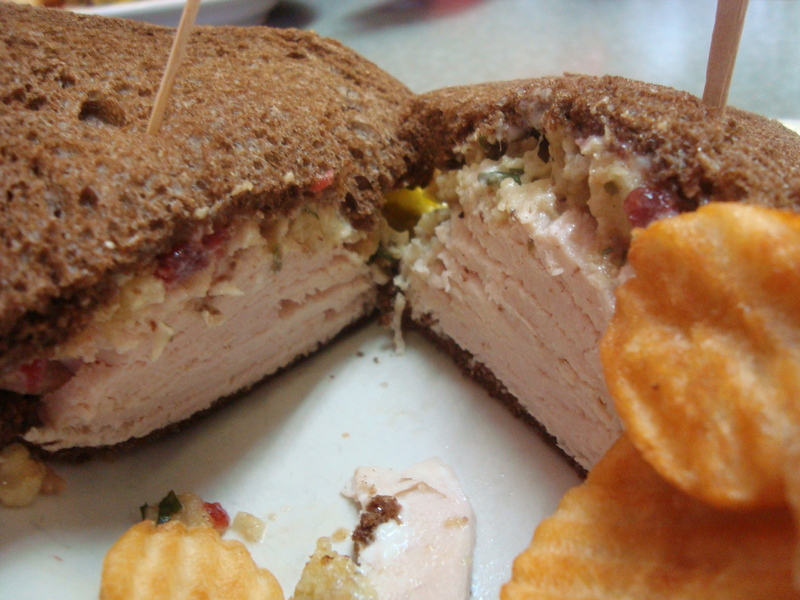 The sandwich had a thick layer of roasted turkey (not cold cuts…the real stuff), cranberry sauce, stuffing and mayo. It comes with a pickle and chips which you can swap out for fries for $1. I opted for the fries. The sandwich was very good and the perfect size for lunch at a price that is hard to beat. I love a good Thanksgiving-style turkey sandwich and this is one of the better ones that I’ve had in the area. Kristin’s is relatively small so sometimes there is a bit of a wait on weekend mornings for breakfast. They are family friendly and have several menu options geared specifically to kids (I’m looking at you, M&M pancakes) There is a small parking lot behind Kristin’s, but if it is full you have a fair chance of finding street parking on the side street.